357 E Poplar - Piggott Realty, Inc. Entire Backyard has new privacy fence with 16' gate opening for easy access. Concrete Patio - Great play area for kids & family entertainment! Detached double garage can also be utilized for workshop plus an additional Storage Bldg inside fenced are. 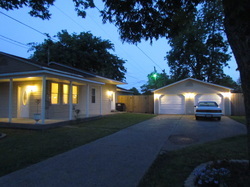 Located near School and walking distance to Fred's & convenience stores. Several nice producing pecan trees. Totally Remodeled & Updated Throughout!